Animal Wildlife | Albatross | The albatross is a large species of sea bird found throughout the Pacific and even the Antarctic oceans. The albatross spends much of its life either fishing at sea or nesting on one of thousands of little islands. There are more than 20 different species of albatross found across the southern seas, but sadly 19 of the different albatross species are said to be threatened with extinction. The albatross is one of the largest birds in the skies as the wingspan of the male albatross can easily reach 3 meters or more in length. The albatross also has a body that is more than 1 meter long (including the tail). 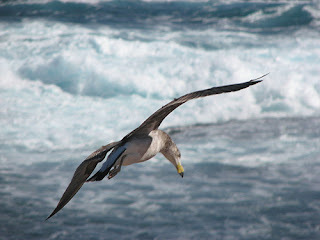 The albatross is thought to be highly efficient when in the air as the albatross is able to cover vast distances with little effort. The albatross also has excellent eyesight as it sees its prey from the sky, swooping down to snap a fish from the surface or sometimes even diving into the water. 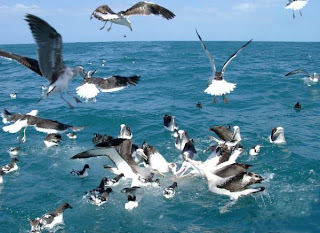 The albatross is a carnivorous bird as the diet of the albatross solely consists of fish and other aquatic animals. The albatross feeds on fish, squid, krill, crabs and other crustaceans by either diving, swooping onto the water's surface or from scavenging the kill from another animal or bird. 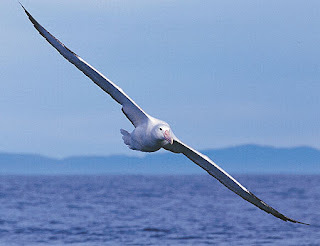 Due to the fact that the albatross is so big and the fact that the albatross nests in such remote places, the albatross has no real predators besides humans who have hunted them in the past, or from tiger sharks who are known to lay in wait when the young albatross chicks are learning how to fly, waiting to snap up any stragglers. 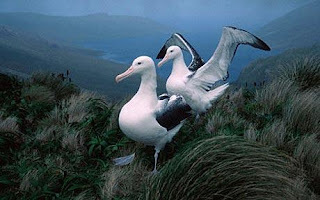 The albatross nests in large colonies on islands or in open forest, where there can be thousands of other albatross individuals. The female albatross lays just one egg that can weigh up to half a kilo! The albatross parents take it in turns to incubate the egg for 2-3 months depending on the size of the albatross species. 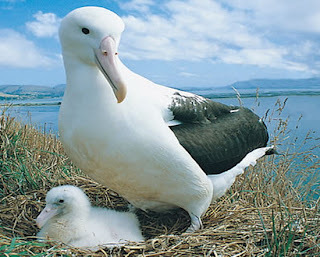 The albatross parents protect and clean their chick until it is able to fly. Albatross chicks can take anywhere from 5 to 10 months to fledge, depending on the size of the albatross species.